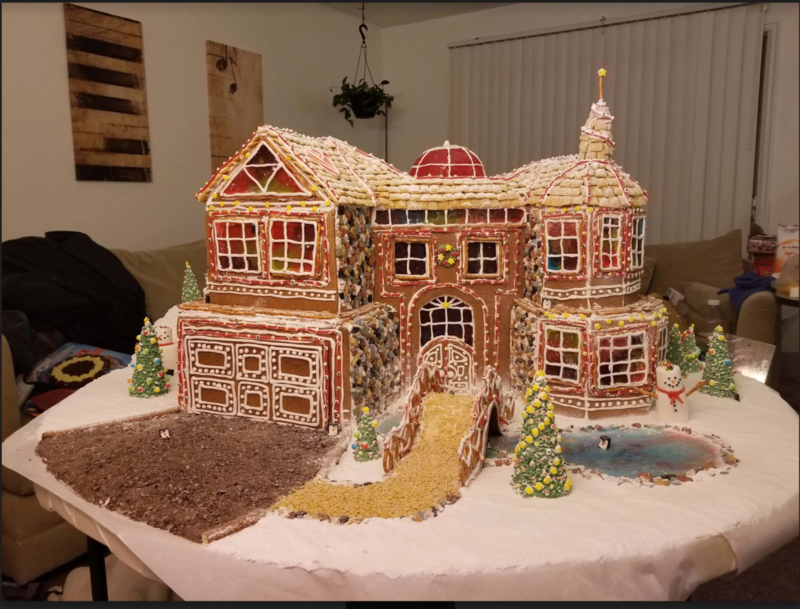 Last month, he amazing architecture-snark criticism site McMansion Hell (previously) announced gingerbread house contest to create "the most nubtastic, gawdawful gingerbread McMansion in all of McMansion Hell!" The winners are nothing short of amazing (and delicious): first prize went to Casa de McGingerHell by Beth and Tina C.: "Located centrally and literally dominating the entire living room, this McGingerMansion features over twenty handcrafted stained glass windows, a double sized garage, and three hand laid rock face walls! This gingermansion also has not one, but two incredible water features including a delightful frozen waterfall in the spacious backyard. Boasting several pre-decorated pine trees surrounding the property, this festive gingermansion showcases several dozen strands of lights and as well as a handful of charming wreaths." From the moat, dome skylight, and lawyer foyer, to the rice crispy treat retaining wall, and chocolate rocks, this house, in the words of Caroline, was “truly next level.” The judges were blown away by the incredible attention to detail and clever use of different materials, specially the pretzel railing on the bridge, the marshmallow penguins, and we all freaked over those sugar glass and water elements. From the several different types of windows, bizarre massing, and three car garage, this house encapsulates the deranged opulence of McMansions in the sweetest way possible.